Instant Pot Pasta Puttanesca is an easy vegan, gluten-free, and oil-free one-pot meal. You don’t even need to boil water to make this delicious dish featuring kalamata olives, capers, and garlic. Did you know you can cook pasta in an Instant Pot? I didn’t until my friend Kathy Hester came up with the easy instructions in her book The Ultimate Vegan Cookbook for Your Instant Pot. Previously, I had been using this small appliance to make meals like Instant Pot Lentil Soup and Quinoa Burrito Bowls, but it never occurred to me to use it for pasta. But it’s such a smart idea, especially for busy people. The greatest part about making a dish like Instant Pot Pasta Puttanesca is you don’t even have to boil water. Or drain the pasta! You simply add all the ingredients to the Instant Pot, give them a stir, then walk away for a few minutes until dinner is ready. That’s pretty amazing, if you ask me. However, keep in mind that you will want to stick to short pastas, such as penne or fusilli. And if you’re following a gluten-free diet, I’ve found that the best types to use in the Instant Pot are ones made from corn, rice, and/or quinoa. My favorites are blends such as corn and rice or quinoa and rice. I recommend you experiment and see which you like that best. But what is Pasta Puttanesca? The name translates to “whore’s pasta”, but there there are different theories as to how it got its name. This delicious creation is made with pantry staples Italians tend to keep on hand. Plus it takes little time to make. So perhaps it was an easy meal to throw together if one had little time between “business clients” and hadn’t shopped for fresh ingredients. 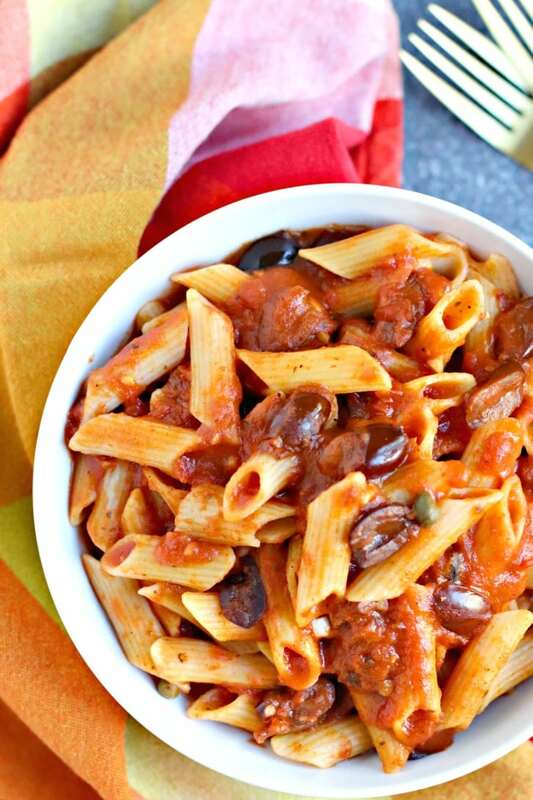 Whatever the origin, I’m glad we can enjoy the combination of pasta, tomato sauce, garlic, olives, and capers today. 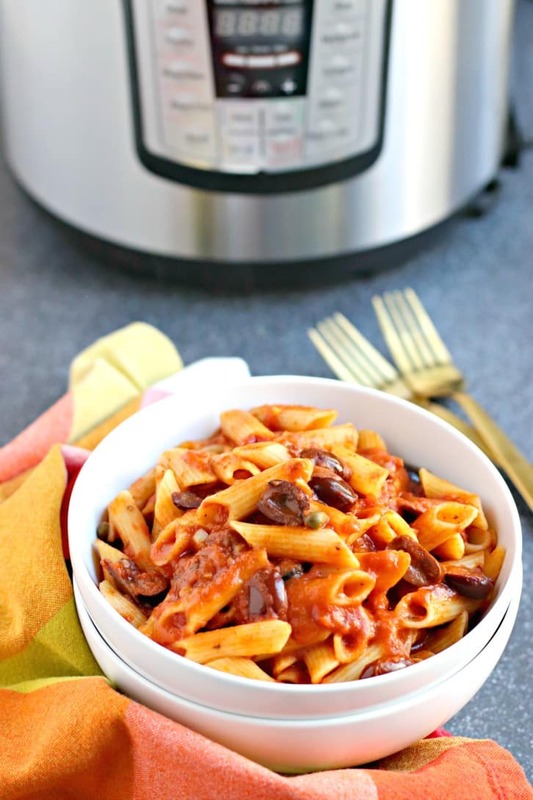 Making Instant Pot Pasta Puttanesca is very simple. First some minced garlic is quickly sauteed in water. Then you mix it all together, close the lid, and set the timer for 5 minutes. Keep in the mind that the 5 minute cooking time does not include the time it takes for the IP to come up to pressure. When the timer on the Instant Pot goes off, quick release the pressure, open the lid, and give it a good stir. Season to taste with a little salt and pepper, and dinner is ready. And you didn’t even have to boil water or drain the pasta! 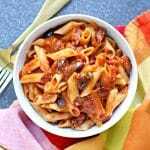 Now let’s make Instant Pot Pasta Puttanesca! 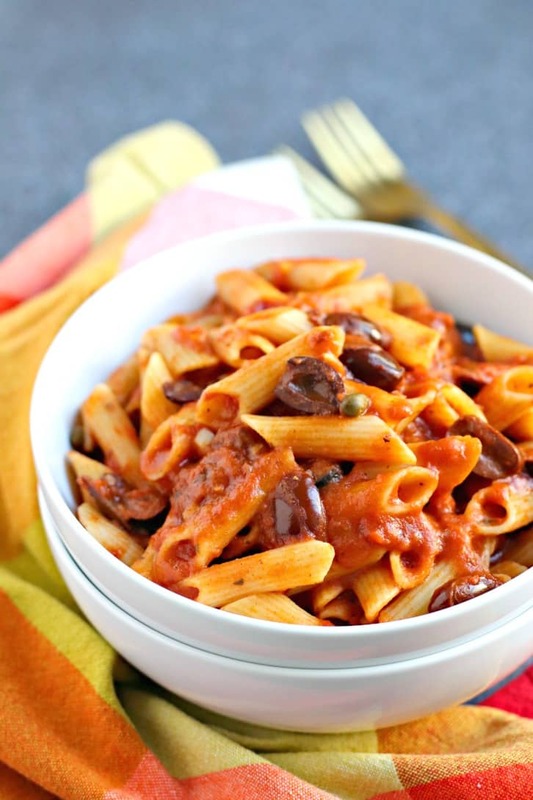 Instant Pot Pasta Puttanesca is an easy vegan, gluten-free, and oil-free one-pot meal. You don't even need to boil a pot of water to make this delicious dish featuring kalamata olives, capers, and garlic. Using the Instant Pot saute function, saute the garlic in a splash of water for about 30 seconds. Hit the cancel button, then add the pasta sauce, water, pasta, crushed red pepper flakes, capers, and olives to the Instant Pot. Mix the ingredients. Close and lock the lid. Press the manual button and set the timer for 5 minutes. When the 5 minutes is up, quick release the pressure by opening the valve. Once the pressure is released, open the lid. Stir the pasta, and add salt and pepper, if desired. Enjoy! If using gluten-free pasta, opt for ones made from corn, rice, and/or quinoa for best results. 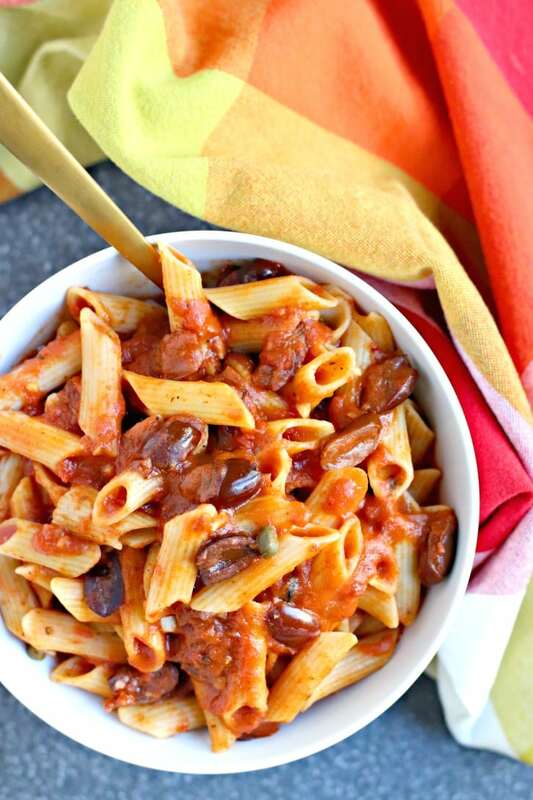 Oh my gosh, we used to have pasta puttanesca weekly when I was growing up. I need to try yours – it looks so much easier than the one my dad makes! It’s so easy in the IP! No boiling water and no draining! I just got an Intstant Pot, so this recipe is happening ASAP! It sounds delish! Thanks Cindy! You are going to love having an IP! Is there a particular instant pot that you recommend?? I think all the models are good. I’ve had mine for over 5 years, so they are built to last! I got a mini IPot for Christmas. It sat in the box for months. It required reading instructions and I truly didn’t want to 1. Be bothered to take the time and 2. Did NOT want yet another appliance on my countertop. That sai, my husband opened it, handed me the instructions and I RELUCTANTLY decided to pressure cook some organic brown rice. I’d forgotten how good pressured cooked food tasted. Then it was beans…thnbYouTube Video’s. I now own TWO (got the 6 qt model) and use both , my VitaMix and live a FAR better life because my food is so much better. This looks so good! It just makes me want an Instant Pot even more! Oh, you definitely should get one, Kate! This pasta is literally calling my name Amy! Love the fact it can be all made in one pot, such a time saver, and so many less dishes to wash! 😉 And these olives look mouthwatering! Great job! I’ve never used an instant pot, and I certainly would have never thought to make pasta in it. And cooked in 5 minutes?? I need to one! Yes! It’s so easy when you’re short on time. Wow, I love that you don’t have to boil water or drain it! It doesn’t get easier than this. Sounds delicious, Amy! Thanks Cadry! It really is a one-“instant pot” meal! This looks amazing!! 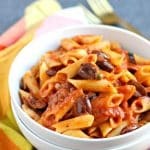 I have never done pasta in the Instant Pot and now I’m thinking WHY??? I am totally making this this soon! Thanks Jenn! It doesn’t seem to work well with spaghetti, but I love it for short pasta. I love puttanesca! Very cool that you can make in the instant pot. The day I get one will be the day my life changes. Haha. Thanks Nicole! Yes, you need one! Love this! Not having to boil the pasta first makes life so much easier and there’s only one pot to wash after. That’s even better! Yes, the easier clean up is the best part in my opinion! Yay! I’ve definitely been using mine a lot, too! And I love making pasta in it during the summer, too, when I don’t want to stand over a hot stove. I’m hooked on my Instant Pot and we love olives! This is a perfect recipe for my family!!! I think you’ll really enjoy it! Thanks Katie! It seems like pressure cookers used to be mainly used for meat. But now that vegans have discovered them, the times are changing! This was the bomb diggity!! The hubs was thrilled. I added some spinach greens to mine. I’m so happy you enjoyed it, Jody! And what a great idea to add spinach. I’m going to try that the next time I make it. Thanks! I’ve been making stove top puttanesca for many years. I’ve had great success doing pasta dishes in the Instant Pot so this should work, too. My only concern is the use of pasta sauce. I’ve always used a large can of diced tomatoes. Would that work here? Or would the pressure cook them away to nothing and lose the extra texture they provide? I haven’t tested the recipe with canned diced tomatoes instead of pasta sauce. I imagine it would work. Please let me know if you try it that way. I have not used my IP yet and would like to make this tonight. If I were to add chickpeas and mushrooms, how do you think this would impact the wait time or amount of water I add? Hi Reva, you could add other ingredients and keep the water amount the same, assuming you mean a can of chickpeas. I don’t recommend adding dried chickpeas that haven’t been cooked. Hi Karen, it sounds like you need to mix the ingredients more before turning on the IP. Probably what happened is it thinks there’s not enough liquid. The next time you get this notice, try canceling and releasing the pressure. Then open the lid and mix everything. I hope this helps! Made this tonight….came out great! Added mushrooms to it and parmesan when serving. I also got BURN ERROR on my instant pot which put me in a panic as I wasn’t sure what was going on or what to do. It is only my 3rd time using the IP. I followed the recipe exactly. Luckily, the unit seemed to reset itself and then cooked for the 5 minutes on high pressure. I was afraid the pasta had fused to the bottom of the pot and burned but it hadn’t. In any case, the recipe does work however it may cause a BURN ERROR on the unit. After looking around on the internet, it does suggest layering the ingredients. Not sure if that would make a difference….. It also says that the sauces should not be too thick especially when using pastas (due to starches released and further thickening an already thick sauce). I used 2 cans of Hunts Thick style pasta sauce so that may have been part of the cause for the error message. I’m glad you enjoyed it, Carla! My IP is an old model that doesn’t have the burn error message, but lately I have heard people mention it when cooking pasta. I’m glad it didn’t actually burn! This was the first thing I made in my new IP! The cook time is way longer than 5 minutes though if you count the time getting up to pressure and the time releasing pressure. The green beans I was cooking on the stove were overdone by the time the pasta was done. Thank you for the vegan IP recipe though! It was good!!! I’m glad you liked it, Mindy! The cook time indicates how long the food cooks after the IP comes up to pressure. Hi there! Why is the prep time 25 minutes? What are you doing? Thanks! Hi Michael, just a little mincing and slicing, but mostly just waiting for the Instant Pot to come up to pressure. Once it does, the cook time is very fast! This was my very first recipe in my instant pot. Pasta is cooked nice but it’s quite soupy, too much sauce and I didn’t even put in the full 4 cups which seemed like a lot when I made it. Can you cut down on the liquid and will it still work? Hi Kim, if your pasta cooked well, you can probably use less liquid and sauce the next time you make it. Just watch your IP because it will give you a “burn” message if there’s not enough liquid. 1. The pasta overcooked, even with using the recipe amounts. Could be though that I didn’t release pressure until 8 mins after 5 mins was done, it was on the Keep Warm setting. Kids were demanding at the table!! 2. I also added Spinach greens, but did so to the initial “mix” in the IP. In retrospect, would def add the Spinach after cooking and just wilt it in. 3. My IP doesn’t have a “Manual” button. I selected “Pressure Cook”, but wasn’t sure what pressure setting to set at, and consistency. I used high pressure, “soft”. Maybe update the recipe for use with more recent version of the IP? 4. Great flavor!! Once I nail the texture, we should be good!! Thanks for the recipe. Looking forward to this and other whole food plant based meals in the new IP. I made this last night – my first instant pot recipe ever! I didn’t have enough pasta sauce, so I substituted 2 cups of diced tomatoes in juice, and added some seasoning to that (Italian herb blend, garlic, a couple tbsps minced dried onion). I inadvertently added about a tbsp of red pepper flakes instead of 1/4 tsp, but I must say I enjoy the spice and if you do, too, you should try it. Husband and house-guest approved, we all loved it. Absolutely delicious! I had a problem with my instant pot but again it was my first use (“burn” message on the LED – I turned it off and everything was fine, nothing burned, I still don’t know what happened). I saw someone mention it was too soupy — I cooked mine (again, accidentally) about 10 mins instead of 5, and it was a perfect consistency, so perhaps try that. This is a really great recipe. We make it and add spinach to it after releasing the pressure. The whole family loves it including the kids. Thanks Eric! I’m going to try adding spinach the next time I make it.